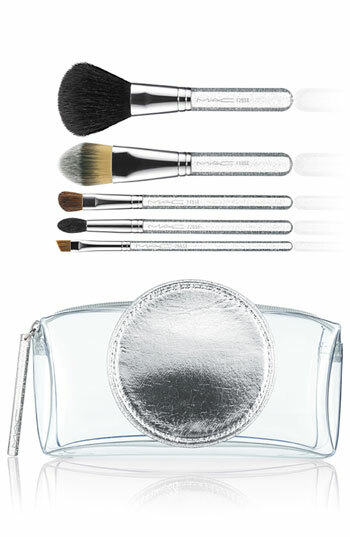 love the lucite handles too-all these brushes on their own would be well over $49! 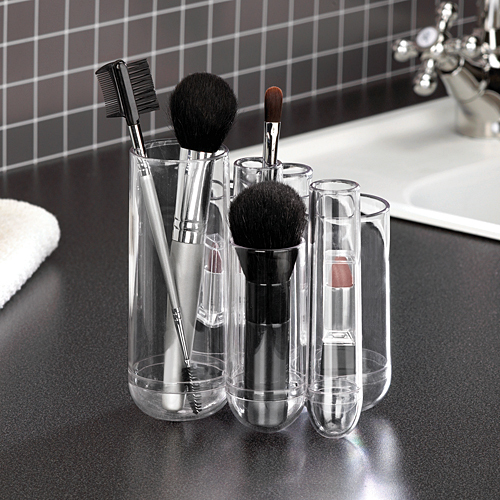 How do you store your makeup brushes? And what's your favorite brand? I store mine in a creamer bowl! Yeah MAC brushes are fab! I've had my set for 7-8 years. I store my brushes in a pretty gass cup? I have a set from Coastal Scents...I've had them about a year and love them. It was a 10(?) brush set for $20 so I didn't have much to lose (except twenty dollars). I store mine in an old candle jar; when I clean them I hang them upside down so the water doesn't get in the handle. I fell in love with that idea you posted last year and immediately ran to my kitchen at the time looking for beans. I ended up using white rice. It falls on the floor from time to time and drives me nutts but its great! As for buying brushes, i used to work for MAC as a freelance makeup artist so I agree MAC's are TOUGH and durable quality brushes. There are lots of great professional brushes out there, however my favorite ones right now are Bobbi Brown because they have long handles and I just love them for blending etc. I use Bobbi Brown brushes, they have wooden handles and they've held up really well for years! Highly recommend. I don't have them out on display but I'd like to get the full set and put them out in a pretty jar. A good set of brushes is one of the best makeup purchases you can make. I only recently discovered the foundation brush - brilliant - so much better than dabbing on with your fingers. I love the Nars brushes. I love my Bobbi Brown brushes, I have a travel case and a glass that I store them in when we are at home. When we move into our new MB. then I will store them in the medicine cabinet. I am in love with my Chanel big brush, eye shadow brush and little liner brush. Same story with the longevity. I store them in a little clear vase. 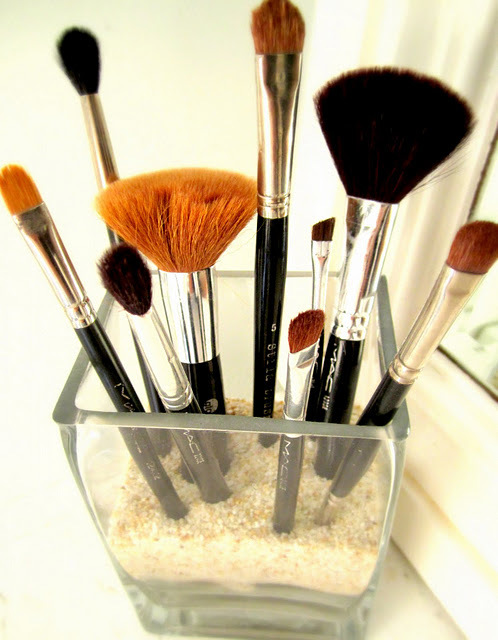 This has always been one of my favorite pics of how to store makeup brushes. I just got a contraption from my MIL this past weekend. It is in three glass, stand-up sections and could be used for mustard, mayo and ketchup or silverware, etc. I put all of my brushes in one, cotton balls in another and nothing so far in the third. Not sure I will keep them like that, but good for now! i actually really like Sonia Kushak's from Target- very affordable and soft. You inspired me to organize my brushes like this last year!! Thanks for simplifying my life!! I am super gross and can't remember the last time I washed my brushes! I recently bought one from everyday minerals super soft and even more affordable! i store mine in a white ceramic cup...they fit perfectly!! LOVE the MAC brushes too, i need a few new ones! I store my brushes in tea cups, creamer bowls, and mason jars (I have lots of brushes). I have quite a few MAC brushes, which I love. I also love my Ben Nye brushes. Love your blog!